film. comment. shower scenes. from the paris of the rockies. Is it too soon to be talking about best movie of the year? If not, Turkish filmmaker Nuri Bilge Ceylan’s taut and ingeniously rendered Three Monkeys certainly makes a strong case for the top slot. It’s a film that manages to be all the more brilliant for what it doesn’t do for the goings-on in-frame: Ceylan’s story of a broken family - Eyup, its beleaguered and frustrated patriarch, Hacer, his yearning, broken-hearted wife, and Ismail, their dull-witted, if well-meaning son - while often bleak, is never cynical or heartless or stretched all out of shape by outsized There Will Be Blood-style emotional confrontations. In fact, director Ceylan’s confident enough here to begin the movie and the events that profoundly change these characters’ lives with something as simple as a man drifting off to sleep behind the wheel of a car late at night. And with a pensive nod, Eyup, in a sleepy gesture of something like what he’s sure is one befitting a man, accepts responsibility on behalf of his employer, that suave driver, and his equally sleepy mistake. We’re never privy to what Hacer or Ismail first thought of Eyup’s dubiously honorable act. Rather, their feelings and the arc of pain Eyup’s flawed sense of pride caused is his family is grist for the rest of Ceylan’s story. That silent, inarticulate despair over love and purpose might just be the heart of the problems with these three monkeys. Perched in their precarious-looking apartment building, with the rest of the world busily coming and going in the nearby a train, or staring out of their window and brooding over an implacable ocean that signals at them everything Eyup, Hacer, Ismail have lost and continue to lose. Ceylan’s exquisite film unfolds in its own deep time, and the striking saturation he and cinematographer Gokhan Tiyraki adds to this poor, sweaty corner of Turkey never overwhelms. It’s the kind of film that we are rarely privileged to see nowadays: a movie which never underestimates the humanity of its characters, or the intelligence and patience of its audience. Be a smarty and go see it at the Starz before it's done gone. Jim Jarmusch’s latest, The Limits of Control, takes aim at Three Monkey’s intensity but misses the mark. Jarmusch’s trademark embrace of classic foreign filmmakers like Pat-fave Ozu and Jean Pierre Melville does not translate well here - his neo-naturalistic and deliberate tempo is best suited to tragicomic characters and situations. There is little of either in what is essentially a movie with a few weighty ideas sunk deep under a deep river of style, numbing repetition and trancey music. Yes, there is Christopher Doyle’s gorgeous cinematography, and yes, there’s some substance; so while there’s lots to gab about afterwards, The Limits of Control is basically two hours of Isaac de Bankole wearing neato suits and a scowl. 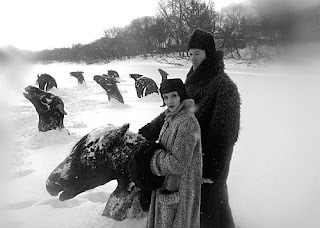 Guy Maddin’s 2008 film My Winnipeg is about memory, secret rivers, love and hate, hockey, Mom, dead horses, the dreamy socialist super heroine Citizen Girl, hockey, family trauma, family triumph, secret back allies, pre-adolescent sexuality, class oppression, the Native people of Winnipeg, and the pointless sweetness of nostalgia. It’s also the best summer movie out there after J.J. Abrams’ fabby re-imagining of the Star Trek universe (a movie that in its own way is also an exercise in memory, love and hate, pre-adolescent sexuality, family triumph, family trauma, and the pointless sweetness of nostalgia). Patrick went to NYU film school and knows all the secrets of the Dharma. More of Pat's film writing can be found here and here. Andrew and Ligature are a glamorous couple straight out of a Woody Allen flick. Joaquin is a filmmaker, 9 to 5 cubicle fodder and a licensed joyologist. Aaron is a media connoisseur, pop culture aficionado, and with his friend, "Madame," entertains children of all ages throughout Capitol Hill. Dex broods day after day on his cunning plan to get a date with Natalie Portman. His past writing on politics, the environment, and life during the Age of Dubya may be found here. Pike Bishop can milk a cow, dress a gunshot wound, and saddle a horse. He once punched a bear for sassin' him. Amber will blind you with science and hit you with technology. pike and patrick: what?! you haven't seen...alfred hitchcock's marnie? aaron - jack white and alicia keys drink my bondshake! patrick reviews three flicks via aaron. Pretty cool thing for the list-ily inclined among us.